Kathy Hinchman, associate dean for academic affairs in the School of Education and professor in the Reading and Language Arts Center, received the Albert J. Kingston Service Award given by the Literacy Research Association (LRA). Formerly the National Reading Conference, the LRA honors individuals with the Kingston Award based upon their distinguished contributions and service to the organization. Kathy Hinchman, center, receives the Albert J. Kingston Service Award. With her are David Reinking of Clemson University and Jill Castek, chairperson of the awards committee. “We were honored to award Professor Hinchman the 2015 Albert J. Kingston award for outstanding service to the organization,” says Jill Castek, chairperson of the awards committee. 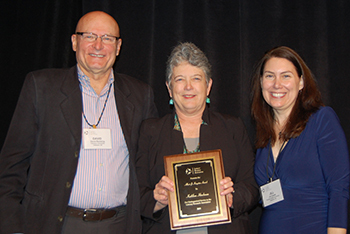 “Nominated by her peers, Dr. Hinchman’s contributions and commitment to the LRA have gone above and beyond, and her esteemed work has inspired, motivated and encouraged many.” Hinchman received the honor at the LRA conference on Dec. 5 in Carlsbad, Calif.
Hinchman, an accomplished leader and scholar, has been devoted to the LRA for 30 years. She has served the organization in such roles as: conference proposal reviewer; conference area chair; field counsel representative; reviewer and co-editor for the annual LRA Yearbook (a yearly publication of conference papers) and the Journal of Literacy Research (formerly known as the Journal of Reading Behavior). She also expanded the reach and impact of literacy research by presenting cutting-edge work at LRA conferences and served as area program coordinator with the late Professor Peter Mosenthal. Hinchman also served on the LRA Board of Directors from 2003-2005, eventually serving as vice president in 2008, and president in 2009. During her presidential term, she was instrumental in establishing (with board of directors support) the Scholars of Color Transitioning into Academic Research Institutions (STAR) mentoring program. Hinchman continues to serve the LRA as a committee member, reviewer and mentor for STAR. “Kathy’s receipt of this prestigious award speaks to her stature within the LRA organization,” says Kelly Chandler-Olcott, School of Education Associate Dean for Research and professor of Reading and Language Arts. Chandler-Olcott says she considers herself fortunate to have worked as Hinchman’s colleague and collaborator for over 20 years. Chandler-Olcott, along with Reading and Language Arts faculty, students and School of Education alumni, attended the LRA conference.